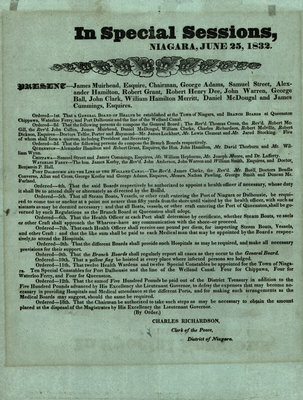 A broadside titled 'In Special Sessions' dated at Niagara, June 25, 1832, ordering that a General Board of Health be established at the Town of Niagara, and branch boards at Queenston, Chippawa, Waterloo, Ferry, Port Dalhousie and the line of the Welland Canal. Present at the session were James Muirhead, Esquire, Chairman; George Adams, Samuel Street, Alexander Hamilton, Robert Grant, Robert Henry Dee, John Warren, George Ball, John Clark, William Hamilton Merritt, Daniel McDougal and James Cummings, Esquires. There are 13 orders in total, providing the details of who is to compose the General Board and Branch Boards; the duties and responsibilities of each Board; compensation for health officers and medical men; and how the establishment of hospitals and a medical presence at local ports is to be paid for. The establishment of the Board coincided with the cholera epidemic of 1832 and was likely created in an attempt to control the spread of the disease. The fifth order reads 'That all Steam Boats, Vessels, or other craft entering the Port of Niagara or Dalhousie, be required to come too or anchor at a point not nearer than fifty yards from shore until visited by the health officer…' The tenth order states 'That a yellow flag be hoisted at every place where infected persons are lodged'.